If you indulge in ice cream from time to time or on a daily basis, you likely have a favorite Ben & Jerry’s flavor. Whether it’s Chunky Monkey or Cherry Garcia, this company, known for its out-there and abundantly-packed ice cream cartons, has a flavor for everyone. A recent decision by the company to phase out all GMOs and only source fair trade ingredients means many of these flavors will be changing, but where food transparency and integrity are concerned, these changes will be all positive. Last year, I reported on Ben & Jerry’s statement that the company would be going GMO-free by 2014. The company already offers food that is 80% GMO-free, though it wants to go the whole 9 yards and build that number up to 100%. Fourteen flavors have already been changed. The remaining will follow until all can carry a label that says “GMO free” and “Fair Trade”. The company is maintaining a blog to track their progress through the transition, where they offer some great information on how complex such a transition can be. In looking at just one flavor, Phish Food, the company had to deal with multiple suppliers, sourcing each component to ensure that it was non-GMO. For some flavors, this has meant changing not only what goes inside, but the name as well. Coffee Heath® Bar Crunch, for example, could no longer contain Heath® bars. Instead, the company had to find another option for the fudge-covered toffee pieces. They did, and have renamed the flavor Coffee Toffee Bar Crunch. The company isn’t stopping at their own products; it is leading the way in campaigning for GMO labeling requirements in their home state of Vermont and across the country. In Vermont, lawmakers recently passed a GMO labeling bill, but it’s already being fought in a lawsuit filed by food producers. 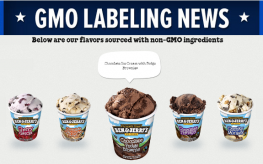 Fortunately, Ben & Jerry’s owner Unilever spent more than $450,000 to try to defeat the California GMO labeling ballot initiative two years ago, so we know that the company is serious about supporting the GMO label. They’ve even changed one flavor to reflect that fight, calling it Food Fight! Fudge Brownie and donating some proceeds to the Food Fight Fund. Ben & Jerry’s currently has no plans to raise prices as they go through the complex and no-doubt expensive transition. GREAT! Now if we can just get Ben & jerry’s to remove the carrageenan that they started adding to their product after Unilever took over. They are still always going to use dairy products from cows fed GMO grains though.